LAWRENCE — It took two days of driving and a special permit for Emily Arsenault and her research team to reach their destination: a spectacular protected area on the 275-mile Delgermurun River, deep within the northern Mongolian wilderness. The crystal-clear river can be frozen half the year in this Taiga wilderness of elk, moose and wolves. The river’s pristine condition was the reason the scientists had come. It’s one of several major Mongolian rivers the team is studying, along with major rivers in the U.S. Great Plains, Great Basin and Mountain Steppes. 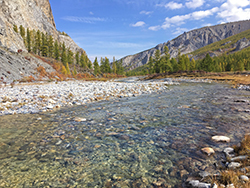 The group is about halfway through a five-year, $4.2 million National Science Foundation grant to study and compare the vast river macrosystems in areas of North America and Asia. KU, which leads the multi-institutional study, announced the grant in 2015. Since then, there have been three month-long expeditions, and Arsenault is the only researcher from KU to have gone on each one. This Friday, Feb. 16, Arsenault will share her experiences on these expeditions, along with photos, at the Kansas Biological Survey’s regularly scheduled Friday Ecology Seminar. Her presentation, open to the public, will start at noon in 130 Takeru Higuchi Hall in KU's West District. The study, which includes nine universities in the U.S. and Mongolia, is led by Arsenault’s adviser, Jim Thorp, a KU professor of ecology & evolutionary biology and a senior scientist at the Kansas Biological Survey. As the lead principal investigator, Thorp supervises the grant and organizes research activities. With decades of experience studying aquatic systems, he is keen to help prepare younger scientists to take the work forward. “The study of macrosystems is a new field, and the students and professors on this river study are working together, contributing to the development of this field,” Thorp said. “As faculty members, we’re using our experience to shape this approach just enough, expecting that the students are the ones who will really develop all this in the future. Not many macrosystems studies have taken place, Thorp said, precisely because the expeditions required to study a whole river require so much coordination and funding. Single expeditions cross political boundaries and take long periods of time. The overarching questions of the KU-led study are based on the theoretical idea that a river’s species assemblages and chemistry vary according to the differing geography and other physical factors in different sites. This diverges from the previously held idea that these characteristics were fairly uniform all along a river and that the river itself gradually widened out along its descent. With half the expeditions completed and the data in the process of analysis, some preliminary findings are emerging. Arsenault said trends in the data suggest that an upland site where a river is wide may support different species communities than an upland constricted site — even when they’re adjacent on the same river. “Now we just need to collect more data and find out if this holds up,” she said. Last September, a team spent a month in Mongolia, splitting time between the Delgermurun River and the Eg River. The group included undergraduates, graduate students, postdoctoral researchers and faculty members from six universities. They studied communities of various fish and invertebrates as well as the geography and function of the rivers’ waterways. 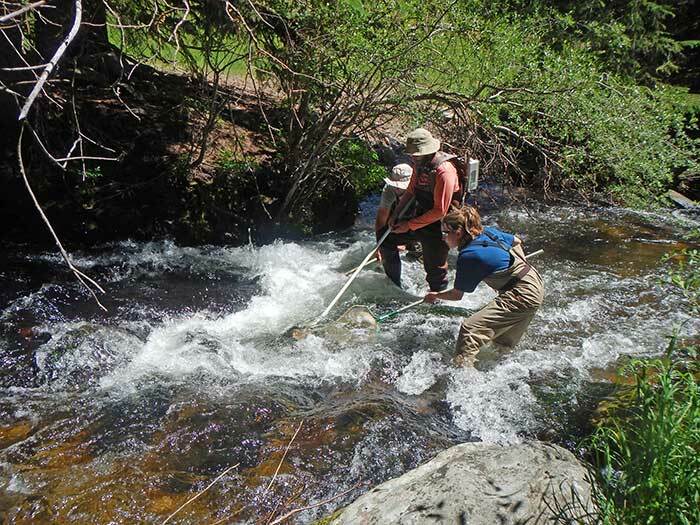 In the Mountain Steppe system in Wyoming, researchers found that almost all the fish they sampled were introduced from hatcheries. The only natives were cutthroat trout, which were few and far between — and even those had been stocked to try to increase the populations in some cases. The counterpart river system in Mongolia had only native fish. Communities were much more diverse, with different types of fish that had different functions in the environment. The project will continue through 2020. The study is supported by NSF’s Macrosystem Biology program in the Division of Environmental Biology. KU provided a vital grant of more than $20,000 for a 2014 workshop that brought together scientists from the U.S., Mongolia and France to develop the ideas for the proposal. The Department of Ecology & Evolutionary Biology is part of the College of Liberal Arts & Sciences, which includes more than 50 departments, programs and centers, as well as the School of the Arts, School of Literatures, Languages & Cultures and School of Public Affairs & Administration. Top photo: KU doctoral student Emily Arsenault is the only team member to have gone on all the expeditions so far as part of a National Science Foundation grant to study and compare the vast river macrosystems in areas of North America and Asia. Credit: Robert Shield. Right photo: The Delgermurun River in the Mongolian wilderness. Credit: Emily Arsenault.